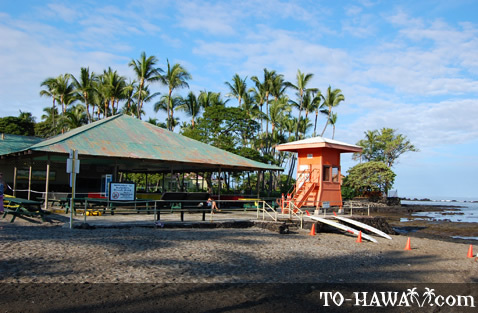 The Big Island has some outstanding underwater scenery, but Kahalu'u Beach Park (view panorama) on the island's west coast just south of Kailua-Kona stands out in particular. The fish here aren't at all wary of the swimmers, as they tend to be in other areas. Indeed, if you hang around long enough, some of them will come up to you and swim by your side. Over 100 species of fish can be observed here. 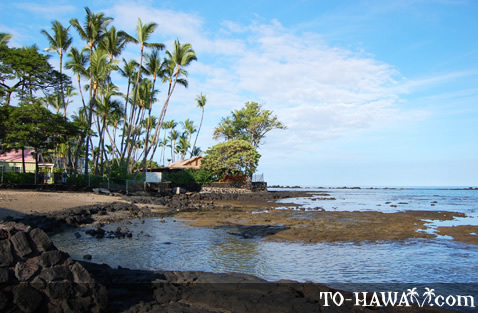 The beach is one of the best snorkeling spots on the Big Island. 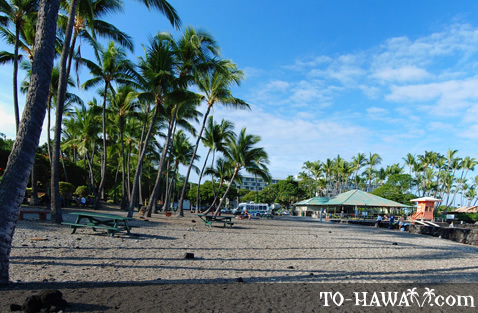 In fact, many tourist maps refer to Kahalu'u as “Snorkel Beach.” Not only humans and colorful tropical fish love Kahalu'u Beach, but sea turtles as well. You’ll probably be able to see some in the water here. 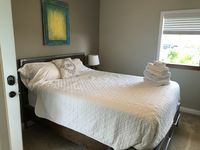 The cove is ideal for novice swimmer and snorkelers as the water is almost always calm (except when there's a big storm or ocean swell coming in). That's because the beach is protected by a partially submerged rock wall, which keeps strong currents and larger waves out. Also, the water is very shallow in the cover, around neck deep in most spots and around 10 feet (3 m) in the deepest area. This is probably one of the reasons why the fish are so plentiful here. The sunlight can reach all the way to the bottom, which grows healthy corals and seaweed. 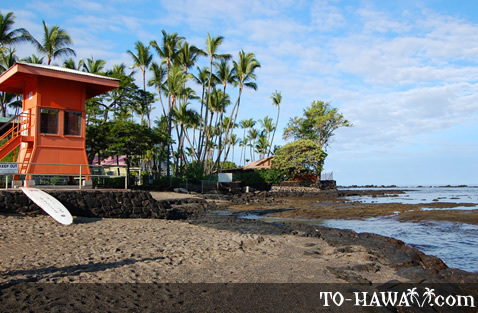 The ocean bottom at Kahalu'u Beach Park has a mix of lava rock, corals and patches of sand. 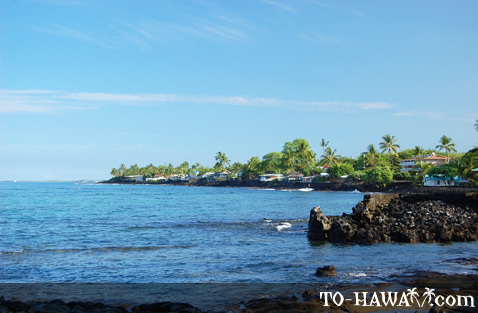 A little bit inland, many Hawaiian house ruins, heiaus and petroglyphs are located in the area, between the park and Keauhou Bay. 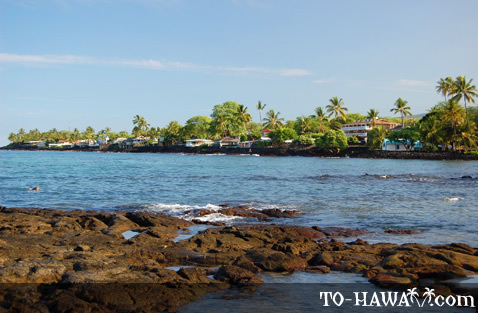 The shoreline consists of white sand speckled with black lava fragments. It's best to get into the water via these sandy areas. 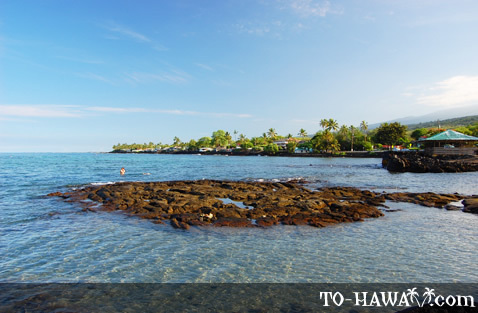 During low tide, a few shallow tide pools surface, which can also be explored. During times of high surf, experienced bodyboarders and surfers venture out to the seaward edge of the reef in the outer area of the bay. 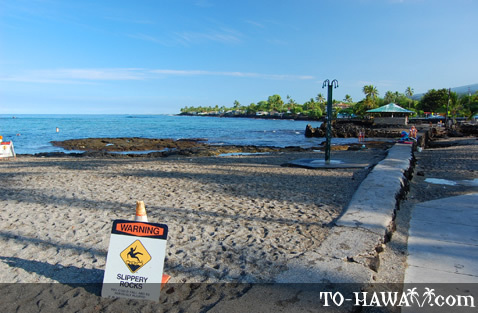 A strong rip current may form during strong ocean swells in the area north from Kuemanu Heiau along the rugged shoreline rocks. 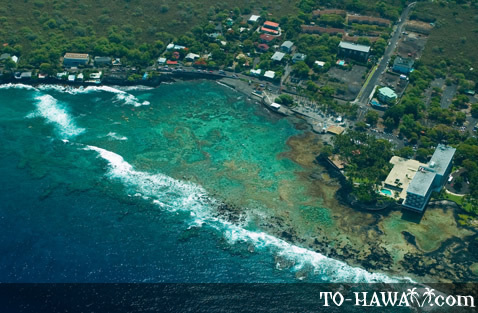 Directions: From Kailua-Kona, head south on Alii Drive for about 4.5 miles (7.2 km). The beach is really 2 small beaches with a covered picnic area, bathrooms,showers, & lifeguard tower. 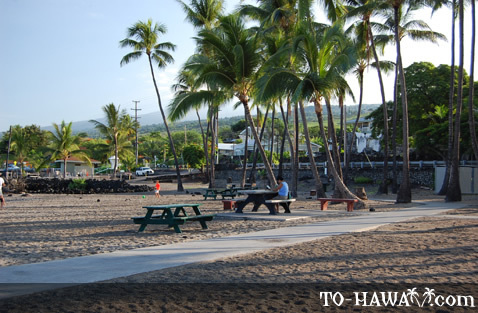 The sand is a mix of black sand and bits of white coral close to the water with fine sand back toward the road. There are vendors that rent snorkel gear and sell snacks/drinks (no alcohol that I remember). The snack truck also has a few small lockers for valuables. Though the enrty into the water is not easy (my 85 year old father needed a steadying hand the first few times across the uneven, slightly slippery rocks)once you get past the rocks, the snorkeling is great! The left half the bay is sheltered by a breakwater and reef and generally has crystal clear water. There are a few "cloudy" spots but that is were fresh water is mixing with salt water. The best water is out and to the south. There is a good variety of fish that because of the shallow bay, are better seen here than the other 2 places I have snorkeled. The right half of the bay is good for surfing. The parking lot is small and fills up quickly! Get there early to ensure a spot. 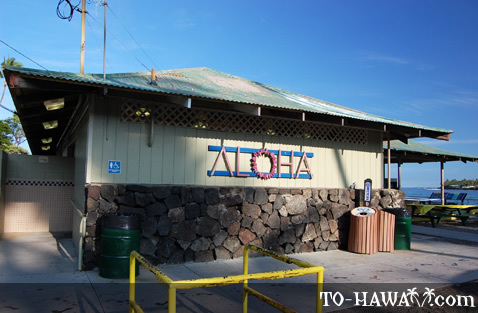 The shuttle that runs along Ali'i is cheap and has multiple pick up stops all along Ali'i. 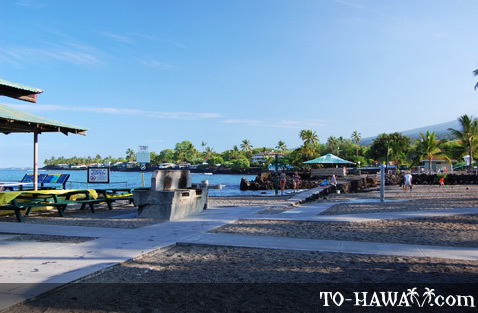 If you only get 1 chance to snorkel in Kona, I suggest this park!